"Generation-Sharing" - Tax Planning That Benefits the Entire Family - Ward and Smith, P.A. Historically, only the very wealthy engaged in generation-skipping planning. It is now common for families of individuals and couples with more modest anticipated estates also to benefit from this type of planning. Initially, many do not engage in generation-skipping planning because of the incorrect belief that assets must pass directly to grandchildren to the exclusion of children. However, it is possible with proper planning to derive the tax benefits of generation-skipping planning and provide children with access to and control over their shares of the estate. Such planning is thus more properly called "generation-sharing." Generally speaking, the Internal Revenue Code imposes a transfer tax at each family generation. If an asset passes from a parent to a child, and then from the child to a grandchild, estate tax is imposed in both the parent's and the child's estates. 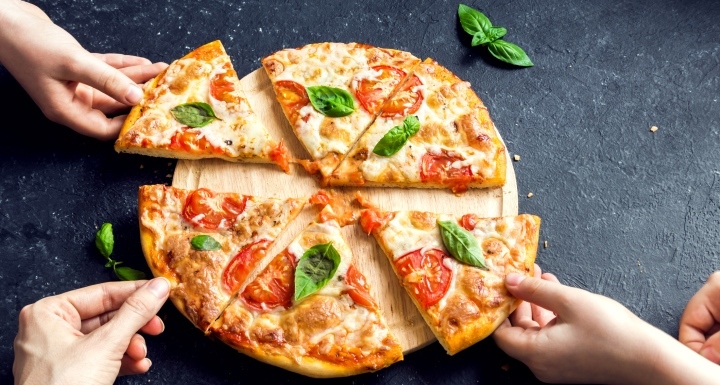 If a parent passes the asset directly or indirectly to the grandchild in order to bypass the child's estate, this transfer avoids estate tax in the estate of the child, but potentially is subject to another transfer tax, known as the generation-skipping transfer tax ("GSTT"). This GSTT is particularly onerous because it is imposed in addition to the estate tax incurred in the parent's estate and is assessed at a flat 40% rate. As a result, when the GSTT applies, it may result in more than 60% of the assets passing to the grandchild being consumed in estate taxes and generation-skipping taxes. However, the Internal Revenue Code provides each individual with a "GST exemption" of $5,000,000 (indexed for inflation to $5,490,000 in 2017). In other words, each individual may engage in generation-skipping transfers of up to $5,490,000 without subjecting those assets to the GSTT. With proper planning, a married couple jointly may make up to $10,980,000 of such transfers. The well-planned use of the GST exemption is an important component of the estate plans of anyone who wants to insulate assets from taxation in successive generations. The simplest use of the GST exemption is to make a direct gift at death to grandchildren. However, many individuals do not want completely to "skip" children. 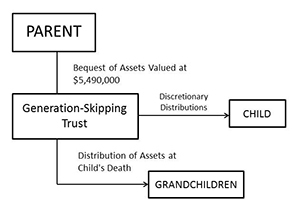 Consequently, it is common for a parent to place the first $5,490,000 (or the first $10,980,000, for a married couple) of the estate in a generation-skipping trust of which the children could be beneficiaries during their lifetimes, but which ultimately would pass to grandchildren or more remote generations of the family without incurring estate tax in the children's estates. With proper planning, each child could be the trustee of his or her own generation-skipping trust, such that a child could make distributions to himself or herself. It also is possible for the generation-skipping trust to shield assets from potential lawsuits or a divorced spouse's claims. Since this planning does not deprive the parent's children of access to the funds placed in the generation-skipping trust, there is little or no disadvantage to incorporating such planning into an individual's standard estate planning documents. Ideally, the GST exemption is utilized with lifetime gifts, which may take the form of transfers to a trust for the benefit of the donor's children during their lifetimes and thereafter pass to grandchildren or more remote issue. Once the gift is made and the GST exemption is applied to the trust, the trust remains exempt from further estate tax or generation-skipping tax for the remainder of the trust's existence. Thus, all post-gift income and appreciation escape further transfer taxes. Several states, including Alaska and Delaware have repealed the common law "rule against perpetuities," which limits the length of time a trust may last. (North Carolina also has repealed its "rule against perpetuities," but the effectiveness of that repeal is uncertain because of a provision in the State's Constitution.) Therefore, if a generation-skipping trust is created under the law of one of those states, the trust may continue in perpetuity, thereby maximizing the utility of the GST exemption. In other words, the assets passing into a Dynasty Trust would never be subjected to estate tax for future generations under current law. 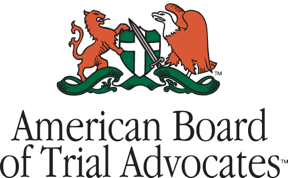 It may be necessary to use a trustee located in one of those states or to invest trust funds in one of those states in order to bring a trust within the laws of such states. For further information regarding the issues described above, please contact a member of the Trusts & Estates practice.